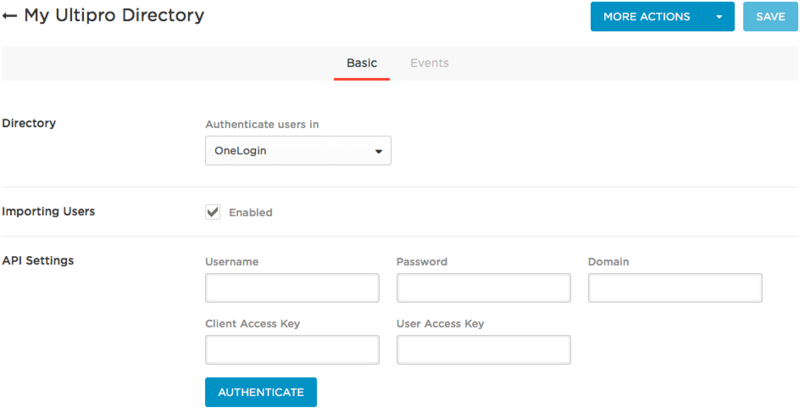 This topic describes how to import users from UltiPro to OneLogin using the UltiPro directory connector, essentially treating UltiPro as your user directory of record. 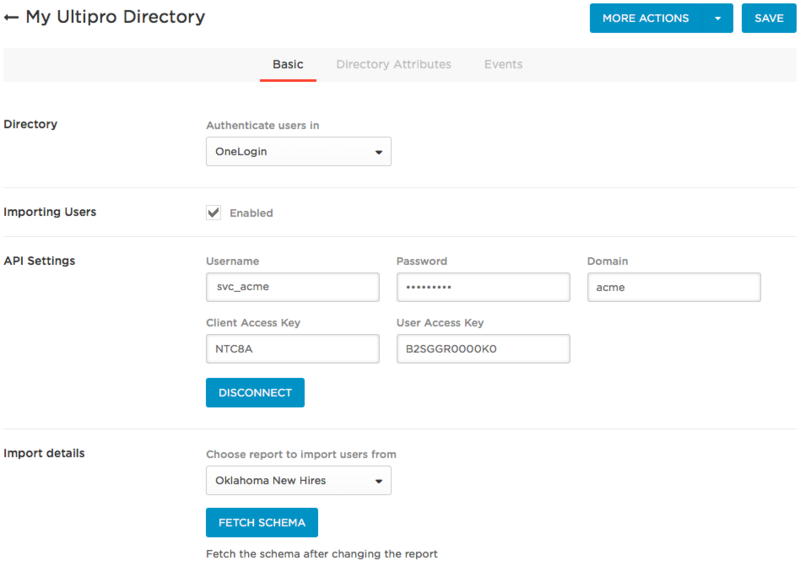 Log into OneLogin as an administrator and go to Users > Directories. Click New Directory and select UltiPro. Click Save to enable additional configuration fields and tabs. To use this directory connector to import users from UltiPro to OneLogin, select Enabled under Importing Users. Enter the API Settings required to connect to the UltiPro API. Username and Password are the credentials for the UltiPro administrator account that has access to the API. Click Authenticate to connect to the API. Wait a few seconds for the authentication to finish. After a successful authentication, the Authenticate button changes to the Disconnect button and the page displays the Import details section and the Directory Attributes tab. Select the report from which you want to import users from the drop-down list. This report also determines the UltiPro fields available to you to map to OneLogin attributes on the Directory Attributes tab. Click Fetch Schema to retrieve the available UltiPro fields to sync with OneLogin. These fields will appear on the Directory Attributes tab when you click Save. 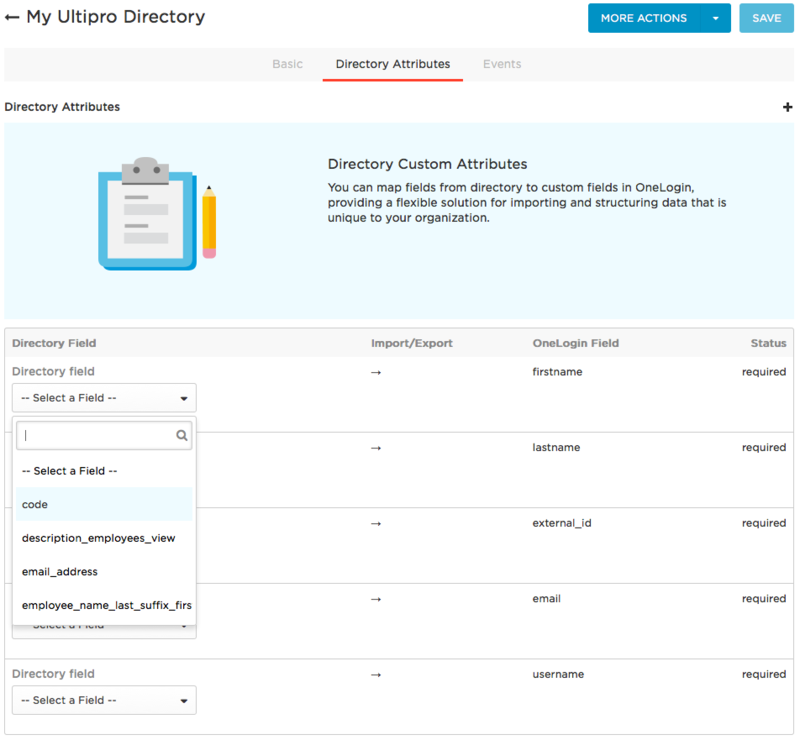 On the Directory Attributes tab, map the UltiPro fields you want to import to OneLogin. Select the Ultipro field from the dropdown in the Directory Field column for each required field. Click the + plus button at the top right to add rows, where you can map additional UltiPro fields to OneLogin fields. For any new mappings, you must create a OneLogin custom user field to hold the value you want to sync with the UltiPro field. All custom fields will be available for selection from the dropdown in the OneLogin Field column in rows that you add. Click the More Actions menu and select Synchronize Users (Force) to initiate the user import. The directory connector also synchronizes users automatically every six hours. Go to the Events tab to view when the user import has finished.